This is Malabrigo worsted in Bergamota, but I think the color could have been called Pomegranate, don't you? As I mentioned in my last post, this is Imagiknit's Shop Sample Pattern #32. I used about 1 1/2 skeins of the Malabrigo on US10 needles to get a 68 in. long scarf (after blocking). I am just squeaking by with the scarf guidelines on this one. 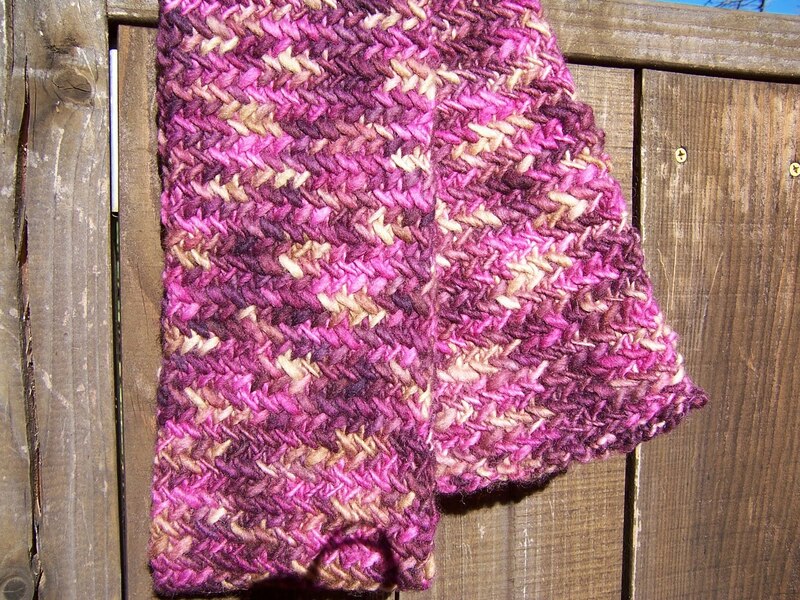 The scarves are supposed to be 5-8 inches wide, and 60-70 inches long. The guidelines are pretty specific because the idea is to give away a good quality (and unisex) scarf that is big enough to wrap warmly and comfortably around someone's neck, but not too big and bulky to fit in the limited space available in the care package. 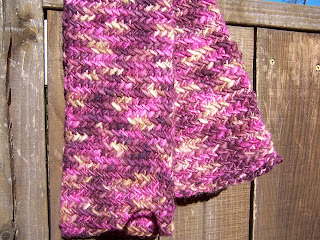 This is My So Called Scarf (Ravelry link) in Manos del Uruguay's Mulled Wine colorway. It just so happens that this pattern is also from Imagiknit's great selection of shop patterns which are free with the appropriate yarn purchase. Again, I feel like I am just squeaking by with the guidelines on this one, this time because of color. So, I checked in with Norma via email. I immediately got a very nice response from her with an a-okay for this specific scarf, and a more general description of the color guidelines. Basically, you want to stay away from pinks and other pastels that might be considered babyish. 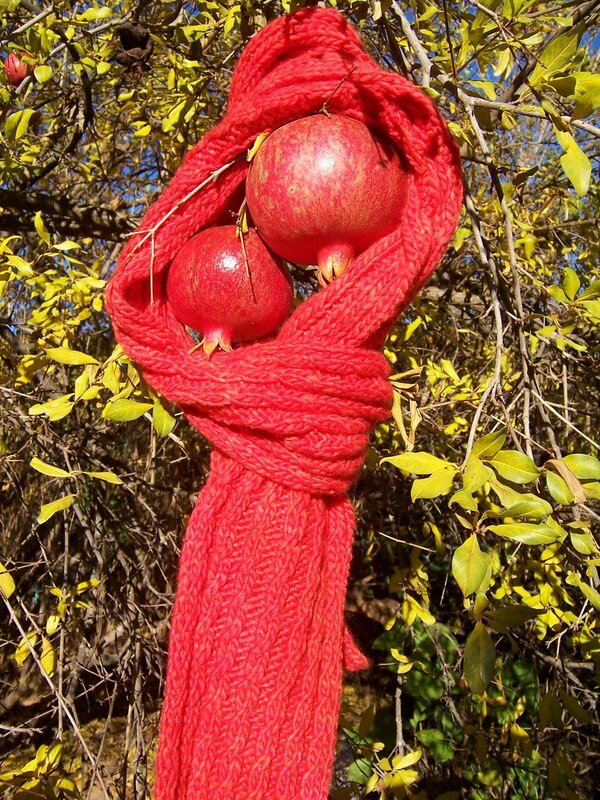 So, if you are checking your stash for the Red Scarf Project, it doesn't have to be red. Any unisex color you think a college student would want to wear is just fine. Maybe you would like to participate, but you don't have time to knit a scarf to be mailed before December 15th. Well, at Norma's regular blog you can also enter to win great knitting-related prizes with a $5.00 donation. 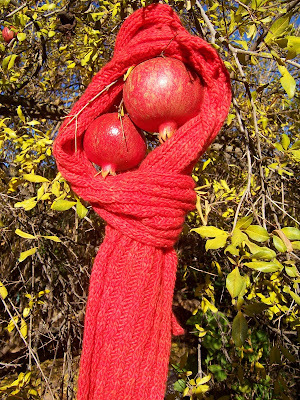 If you do want to knit a scarf though, you can check both OFA's website, and Norma's Red Scarf Project Blog for a list of free patterns. Happy knitting!